Despite two previous albums that brought the Moody Blues attention early on, In Search of the Lost Chord was the release that defined them going forward. Their debut, The Magnificent Moodies, identified them as a blues band, but by the time its follow-up, Days of Future Passed, arrived, the original group had disbanded, leaving drummer Graeme Edge, flautist Ray Thomas and keyboard player Mike Pinder without the essential guitar and bass, and a formidable frontman. That problem was solved when John Lodge, one of the band’s original founders, returned to the fold, bringing singer/songwriter and guitarist Justin Hayward with him. With their two new recruits in the fold, the Moodies made a similarly emphatic impression with Days of Future Passed, and while conceptually it would set a standard for future efforts, credit needed to be shared with the London Symphony Orchestra for its merger of rock and orchestration. Likewise, while two of its songs would go on to become an indelible part of the band’s repertoire — specifically, “Nights in White Satin” and “Tuesday Afternoon” — the narrow theme of dawn to dusk suggested that few of its other songs would break out of the box. Consequently, when In Search of the Lost Chord made its way to store shelves in July 1968, the most immediate impression was focused on the selection of songs. “Ride My See-Saw” remains one of the band’s most requested signature standards even now, and no Moodies concert is complete without its inclusion as part of the encore. “Voices in the Sky,” “House of Four Doors,” and “The Best Way to Travel” offered odes to psychedelic suggestion, a theme that would inspire many a college kid to acquire incense, black light posters and, most importantly, towels that could be shove under the dorm room door to prevent the noxious fumes from certain inhaled substances from attracting a neighbor’s notice. Indeed, given a theme that revolved around such a cosmic quest, In Search of the Lost Chord inevitably became a baby boomer’s audio bible of sorts, a guide towards discovering the truths yielded by a higher state of consciousness when plied by the usual artificial additives — cannabis and LSD in particular. References to the latter were especially prominent, not only in the aural and lyrical exposition of the album overall, but especially in the celebratory salute to drug guru Timothy Leary, prominently mentioned in Ray Thomas’ “Legend of a Mind,” a song that effectively summed up all the good doctor proudly prescribed. That digression into drugs notwithstanding, In Search of the Lost Chord also spotlighted the Moodies’ musical skills as well, with no less than 33 instruments employed between the five musicians, among them, such exotic accoutrements as mellotron, harpsichord, tambura, sitar, obie, cello and tabla. 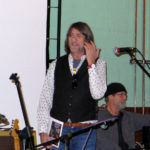 It also continued the tradition begun on Days of Future Passed, which found Graeme Edge composing a pair of poems that bookended the entire opus, “Departure” and “The Word,” narrated by Edge and Mike Pinder, respectively. Although the album reached the top five in the U.K., it didn’t penetrate the top 20 in the U.S., and neither of its singles, the most worthy “Ride My See-Saw” and “Voices in the Sky,” made any significant dent in the top 40 charts either. Nevertheless, In Search of the Lost Chord still stands as one of the seminal albums of the late ‘60s and a standard by which prog rock was meant to be measured. Clearly, the search for the chord continues. such an underrated group of incredible songwriters.